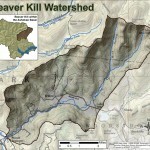 The Beaver Kill begins on the slopes of Plateau and Sug­ar­loaf moun­tains in the Town of Hunter (Greene County). It is a sig­nif­i­cant trib­u­tary to the Eso­pus Creek. The stream runs for 12.5 miles south-southeast, through the ham­let of Wil­low (Town of Wood­stock, Ulster County), end­ing at the con­flu­ence with Eso­pus Creek in Mt Tremper. Over its course, the Beaver Kill has three dis­tinct geo­mor­phic sec­tions. At the head­wa­ters and down through Mink Hol­low, the Beaver Kill is a very steep, nar­row moun­tain­ous stream. The mid­dle sec­tion of the stream, near Wil­low, flat­tens out dras­ti­cally. At this loca­tion, the Beaver Kill and its sur­round­ings look com­pletely dif­fer­ent from the head­wa­ters. The val­ley is broad and the stream is highly sin­u­ous with many adja­cent wet­lands. 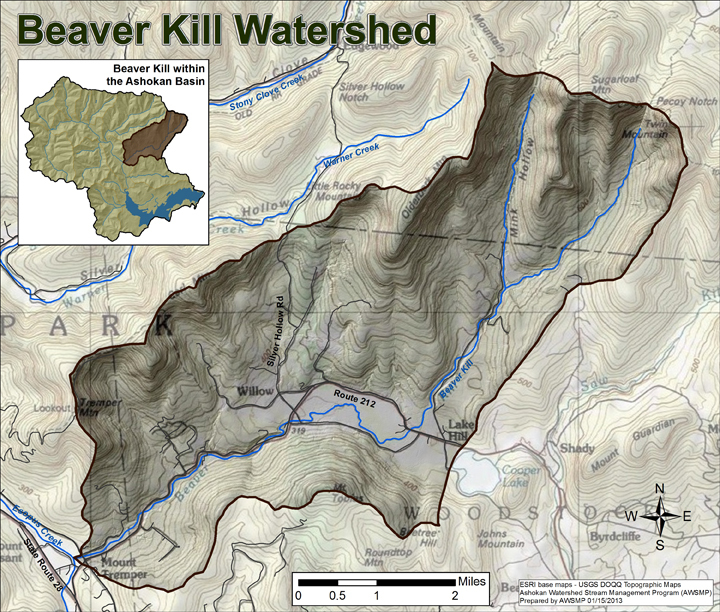 After Wil­low Flats, the Beaver Kill regains its steeper slope, flow­ing through a nar­row val­ley adja­cent to Route 212 until it meets the Eso­pus Creek at Mount Tremper. In 2010, Ulster County Soil & Water Con­ser­va­tion Dis­trict staff, with assis­tance from the Stu­dent Con­ser­va­tion Asso­ci­a­tion and Ulster County Com­mu­nity Col­lege, com­pleted a two-year assess­ment of the Beaver Kill stream cor­ri­dor. The team ana­lyzed his­tor­i­cal data and walked the stream to inven­tory stream fea­tures. The assess­ment iden­ti­fied loca­tions of bank ero­sion and sed­i­ment accu­mu­la­tions, large woody debris (LWD), threats to infra­struc­ture, and areas where past man­age­ment of the cor­ri­dor has taken place. Data col­lected from this assess­ment is being used to develop a stream man­age­ment plan. The plan will doc­u­ment stream cor­ri­dor con­di­tions and offer rec­om­men­da­tions for future man­age­ment of the Beaver Kill sys­tem. 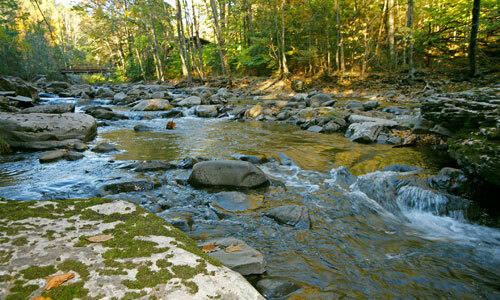 Rec­om­men­da­tions will be pro­vided for stream­side landown­ers, munic­i­pal­i­ties, and gen­eral cor­ri­dor management. In 2012, the Ashokan Water­shed Stream Man­age­ment Pro­gram granted the Town of Wood­stock par­tial fund­ing to com­plete a Town of Wood­stock habi­tat map, which included the Beaver Kill stream cor­ri­dor. The map was devel­oped by the non-profit orga­ni­za­tion Hud­so­nia, Ltd. Hudsonia’s biol­o­gists mapped eco­log­i­cally sig­nif­i­cant unfrag­mented forests, mead­ows, shrub­lands, inter­mit­tent wood­land pools, and wet­land com­plexes in the Beaver Kill stream cor­ri­dor. The wood tur­tle was iden­ti­fied as a pri­or­ity stream cor­ri­dor species for con­ser­va­tion in this water­shed. See Hudsonia’s report for more infor­ma­tion on con­serv­ing wood tur­tles and their habi­tat in the Beaver Kill.